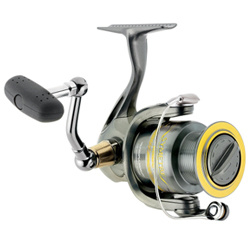 The Symetre Spinning Reel from Shimano offers an impressive mix of features at a great price! The ultra-popular Symetre Spinning Reel now features Shimano's Propulsion Line Management System, combining five advanced components for superior casting and smooth, twist-free retrieves. Cold-forged aluminum spool; reliable S-Concept engineering with Fluidrive II, Floating Shaft, Dyna-Balance, Super Stopper II and Slow Oscillation system. "I bought this reel about 2 weeks ago, and I couldnt wait to see how it performed, being its the most money i've spent on a spinning reel." "This reel looks and feels sharp. The new design and features make this reel really scream. There's only 4 bearings + 1 roller bearing, but make no mistake, this reel does not lack smoothness." ""I've used many different reels over the years and the symetre has been the best yet. The rear fighting drag was the reason I went with the symetre, but without it I won't buy another one"